This pro-second amendment page on the Governor’s web page touting his support for bills to allow the carrying of weapons in bars and in daycares, was scrubbed after the Parkland massacre. Today, Plain Dealer columnist Brent Larkin came out guns blazing (pun intended) in a scathing editorial about Governor Kasich’s “look at me, I’m for reasonable gun reforms” talk with no corresponding action. Kasich last showed leadership on the gun issue 24 years ago, when, as a Republican member of Congress, he voted for a now-lifted assault weapons ban. When it comes to the gun lobby, Kasich didn’t bury his head in the sand. He buried it somewhere else. Kasich spent the most important years of his long career in public life supporting laws that could turn day care centers into shooting galleries. Where’s Larkin coming from? 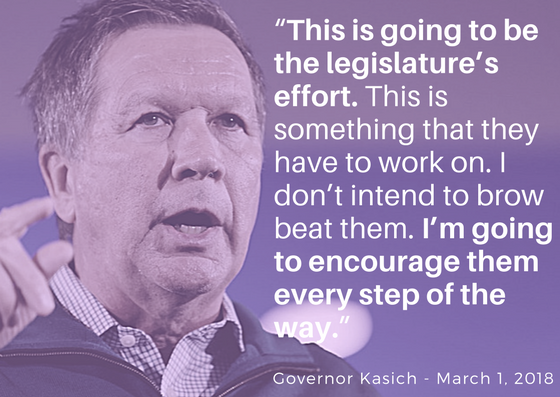 Kasich announced a six-point proposal to change Ohio’s gun laws. Why they skepticism? We’ll get to that. First, here’s a look at what’s in the Kasich plan and what he–and Ohio lawmakers– are doing about it. The platform announced by Governor Kasich on March 1 makes clear he hopes to pass gun reform without frightening those who wish to keep the second amendment alive. Kasich has relied on an advisory group to craft his policy. Members include Former Senate President Doug White (R), Former Ohio Attorney General Betty Montgomery (R), Former Senate President Tom Niehaus (R), Former Congresswoman Deborah Pryce (R), Former State Senator Nina Turner (D), John Born, Kasich’s Department of Public Safety (DPS) Director, Toby Wagner, Kasich’s Ohio Department of Natural Resources Chief Law Enforcement Chief, Jim Tobin, Catholic Conference of Ohio, and Former State Rep. Ron Maag (R). The panel advised him on crafting and supporting these potential gun policy points, some of which are incorporated into bills currently in various stages of progress in the Ohio House and Senate. His policy proposal also lacks critical gun law bills other, safer states have incorporated. 1. Gun violence protection orders. The courts would be allowed to take away someone’s guns if the person is found to pose a threat to themselves or others and families would be able to initiate the process.This mirrors the Red Flag Laws on the books in California, Oregon and Washington. SB278, which was introduced by Senators Schiavoni and Williams, would replicate other states’ Red Flag Laws. This bill could also prevent suicides and in 2016, 924 Ohioans committed suicide using firearms. SB278 has gotten no hearings. 2. Updates to the background check system and penalties for jurisdictions that fail to update the registry in a timely manner. There is no deadline on updating records and this proposed measure would ensure that records are kept up to date frequently and correctly. This would not enforce a background check in all gun sales, thus keeping the gun show loophole alive. The law would only force local courts to comply with existing mandates. None have been introduced. Kasich has not announced any plans for legislation. 3. Ban on bump stocks. HB 395 from Representative Patmon would ban bump stocks. It has had only one hearing so far. SB 219, from Senator Thomas, would prohibit items that accelerate a firearm’s rate of fire without converting it a fully automatic weapon, but has yet to have a hearing. 4. Ban on armor piercing ammunition. 5. Keeping firearms away from Domestic Violence Abusers and other criminals. 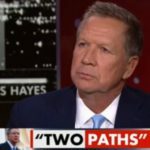 Kasich wants to mirror federal law that outlaws possession and purchase of guns from those who are domestic abusers and have other criminal charges on the record. That way, state law enforcement could be authorized to seize guns instead of having to rely on federal officials to do so. SB 150, from Senator Edna Brown, would prevent Domestic violence abusers from obtaining guns. It has had one hearing so far. HB305, from Representatives Antonio and Boyd, would allow courts that determine a person is ineligible to carry a firearm to continue to carry or possess a firearm to transfer firearms to a federal authority or licensed arms dealer. This bill has had one hearing so far. 6. Outlaw “Strawman” purchases. Kasich’s team proposes outlawing purchases for a third party even if that third party is legally allowed to own and buy a gun. HB 151, proposed by Representative Patmon, would make these types of purchases illegal and would enforce background checks and more thorough record keeping. SB 283, from Senators Thomas and Schiavoni, would enact the same law as the House bill, but has yet to have a hearing. What’s He Doing About It? So where’s the encouragement? When will he endorse legislation or push for committee hearings? The fact is, since his March 1 announcement of his six-point plan, Kasich has been all talk and no action. Democrats–who are doing the hard work of drafting legislation (both those listed above, and far more impactful bills that Kasich has not said he would support)–say they haven’t heard from the Governor. 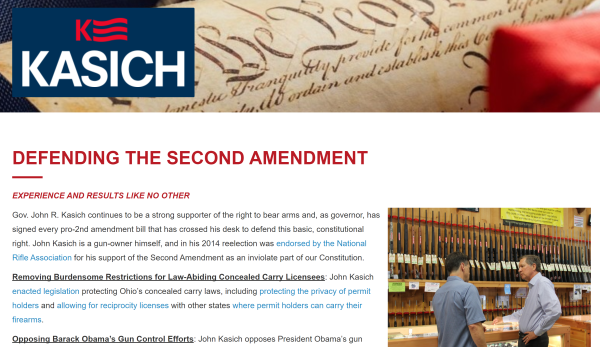 Kasich has made no public endorsements of legislation, currently pending in the General Assembly, that would meet four of the six pillars of his gun platform.